Bumble On | Food It Yourself! On Saturday July 18, 2015 I went to a lecture on the importance and identification of bumblebees. It was held at Tower Hill Botanic Garden and was very well atended. The presenter, Dr. Robert Gegear, is passionate about what he calls beecology- studying the important role of bumblebees and other pollinators in the overall environment. Here’s his website. The original plan for the event was for a short presentation on how to identify bumblebees followed by some crowd-source bee identifying out in the gardens. This being New England, the weather did not cooperate. A gray sky threatened to pour, and by blocking the sun kept the all but the pluckiest bumblebees at home. The extended lecture time was very instructional, however. Here are a few key points I took away from the presentation. Do note I’m leaving out some details on purpose to encourage you to browse Dr. Gegear’s web site and to see him speak if you are able. Bumblebees are mysterious! We have an idea about what kinds of places they like to nest in- abandoned rodent dens are a coveted resource-but very little is known about what dwelling space is preferred by which species. Bumblebees are smart! They learn by site which flowers offer the most nectar and pollen and will seek those flowers specifically. Sequentially visiting flowers of the same species means good pollination. It also means you may see the very same bee bumbling about your garden from day to day. Variety matters! “Adequate pollinator population” does not simply mean “all the crops got pollinated”. A truly healthy ecosystem requires a variety of bumblebees. A corollary to this point is that a “pollinator garden” should have a wide variety of flower shapes available so both long and short tongue varieties of bumblebee can access nectar and pollen. Evidently, I am an instinctive bumblbeecologist. I have piles of grass clippings in every corner of my lawn and there are a at least a dozen species of weed and garden plants blooming on my property at any given frost-free time. My neighbors just think I’m sloppy at yard work, but what do they know? We were issued printed sheets to help us identify any bumblebees we might encounter in New England. Dr. Gegear then gave an informal quiz by showing us slides of bees. As instructed, we looked at the abdomen and thorax, then the face of the bees to identify them. We were so good at it! After the lecture, some listeners stayed back to chat with Dr. Gegear and look at preserved specimens under microscopes. Others (my mom and I included) went out into the gardens to see who might be buzzing about. Several mint varieties were in bloom and attracting bumblebees. With our fellow lecture attendees we turned to our identification sheets to categorize the bumbles. Our confidence quickly waned as we realized that, in real life, bees don’t sit still so you can see how many yellow thorax segments they have or if the fuzz on their face is black (female bee) or yellow (male bee). Our appreciation for the importance of Dr. Gegear’s work had already been gained. I now appreciate the difficulty of the work for him his research assistants. 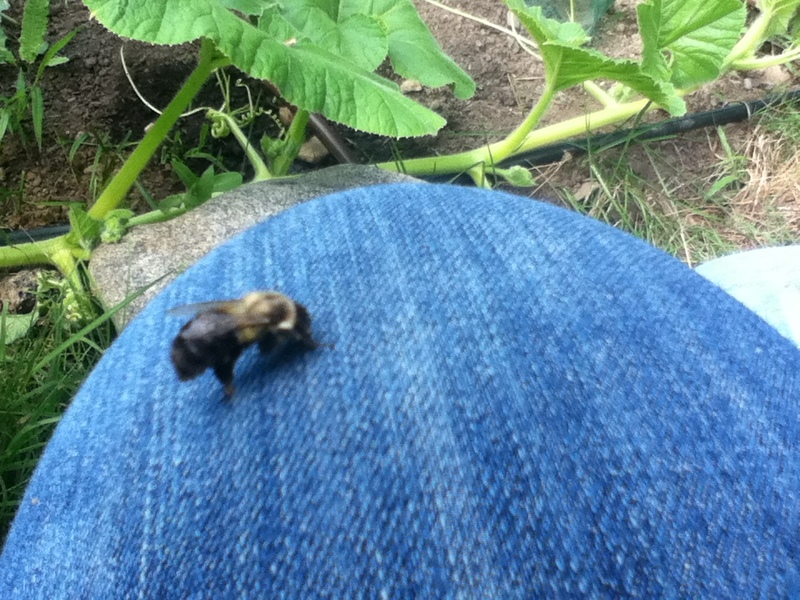 I am highly motivated now to keep track of which bumblebee species visit my garden. I think the one in the picture above is a Bombus bimaculatus. I even got my identification sheet laminated. Bees are important. Seriously, you should look at Dr. Gegear’s web site and go to one of his bumblebee talks if you can. We need to keep populations of these important pollinators healthy, but first we need to understand them better. Give it a try!